Yesterday's 3DS price-drop was sudden. It caught many off guard, including some Japanese game retailers. One Japanese shop posted a notice that until August 11, when the price drops ¥10,000 (US$129), it will refrain from selling the 3DS. This is leading to speculation that retailers are being burdened with heavy inventories and might take a loss on 3DS units they've already purchased. The Akihabara branch of Sofmap, one of the country's biggest game retailers, sent out a tweet hours ago, notifying folks that the price of used 3DS units is being slashed—from ¥22,800 to ¥13,800. 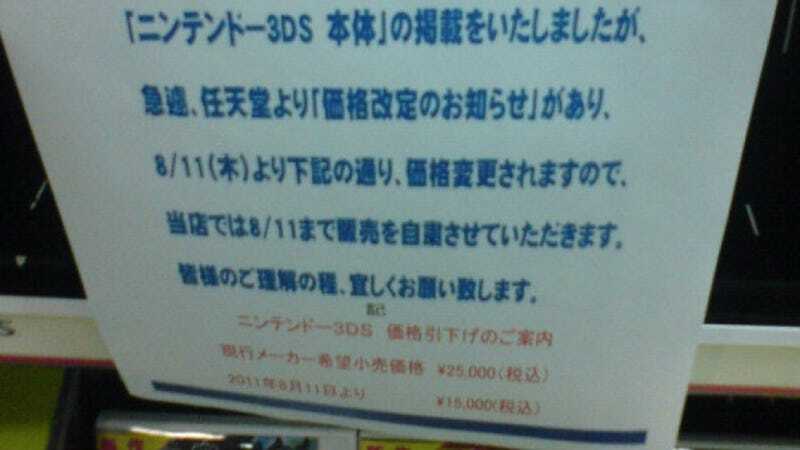 Sofmap said there are limited number of 3DS units, encouraging Twitter followers to act quickly. Other photos floating around online in Japan show game shops with large inventories of used 3DS units. One store is only buying back 3DS units for ¥1,000 or $12.87. This is anecdotal evidence at best, but with the low sales numbers, it's hard not to think that the rot has already set in. What could change the tide is a redesigned 3DS, which is looking increasingly like an upcoming inevitability. You can contact Brian Ashcraft, the author of this post, at bashcraft@kotaku.com. You can also find him on Twitter, Facebook, and lurking around our #tips page.